Stations of the Cross will be prayed after all Masses on Fridays in Lent unless otherwise announced. With the basement construction project completed, (thanks to your many sacrifices and generosity!) the 9:00am Mass on Friday will resume beginning on April 6th. God reward your for your patience during construction! Due to the very noisy and disruptive jack-hammering which will begin in the basement this week, there will not be a 9am Mass on Fridays until construction is completed. Please note there will also not be heat in the church during the daytime during construction hours. We hope to have all construction work completed by the 1st week of April. Your continued patience and understanding are appreciated. Thursday, January 11—NO MASSES this day. In order to solve ongoing issues with groundwater seepage into the basement, there will be construction commencing in January to excavate the church foundation in order to ensure proper water drainage away from the building. We have been assured by the various engineers that have been consulted that this should alleviate our basement water issues. This work will is scheduled to begin towards the end of January. As part of this work, a drain tile system and sump pumps will be installed in the church interior. This will be an involved process. There will be sheet rock and floor tile demolition, dismantling of parts of the kitchen, jackhammering of concrete and all manner of upheaval. The parish hall and bathrooms will be largely unusable at least in part. It may well be that we are several weeks without Catechism and coffee and doughnuts. We appreciate your cooperation and your prayers during the discomfort but in the end we hope to have a basement with proper drainage free of flooding and water issues. Soon after New Year’s, we will have a working party to gather all the basement contents in an appropriate fashion and do a lot of covering with plastic. More information with be forthcoming. You continued generosity is greatly appreciated. Retired Archbishop James P. Keleher will be conferring the sacrament of Confirmation here at St. Philippine Duchesne on Saturday, April 21st at 9:00am. If you or your child are in need of the sacrament of Confirmation please let one of the priests know so that we can get your information and ensure that you are enrolled in the appropriate class. Our Statue of the Divine Infant of Prague has arrived. 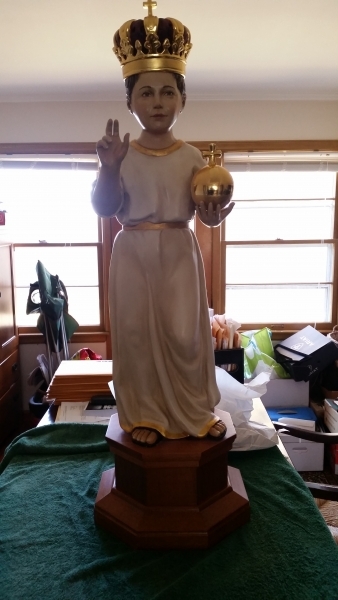 We still need to fashion a pedestal and have vestments made in order to install the statue in the Sanctuary. Many thanks to all who donated. If anyone wishes to donate towards completion of the project, they may of course do so. In addition to the regular schedule, Confessions will now also be available in the church from 5:00pm – 5:30pm on Saturday afternoons. We hope this addition will alleviate the sometimes long Sunday lines as well as provide more opportunities for those who have busy schedules during the week.